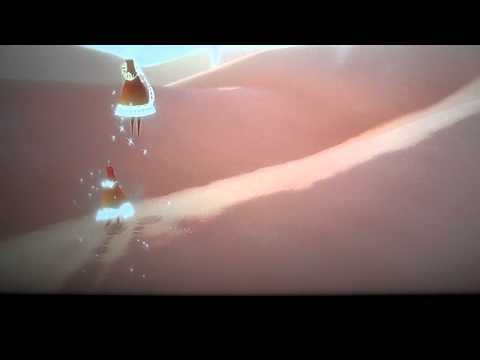 (Sept.23rd, 2011) — We got some time to play Journey, the upcoming PS3 adventure game. We have some footage of us playing it, experiencing it in all it’s open ended glory. While I did find myself losing direction from time to time, and it did take a few moments to get a grip on exactly what I was suppose to do or not do I did enjoy my time with it. It follows in the footsteps of thatgamecompany‘s previous titles. Like Flower, it’s art style is distinctive and unique in every way imaginable. The draw distance is impressive, and it very well may possess the best sand I’ve seen in a game, not that there is much competition for that. Journey doesn’t guide you too much. It doesn’t hold your hand, but it does leave an easy to understand objective directly in plain sight. The game is easy enough to control. Everything is self explanatory. This isn’t the type of game that even an uninterrupted 20 minute demo can explain. You won’t know the true scope of what you will get in terms of entertainment until you buy the title, come Spring 2012 as a representative of thatgamecompany informed me. It is more of a video game than Flower was, while still keeping the aesthetic of never being to direct or linear. The freedom you have as you explore a vast, empty world is really worth the hype, even if I can’t exactly put my finger on why in detail. I want to play more of Journey, I really do. I just can’t say precisely what draws me to it. It feels like an interactive screen saver at moments, and at others it feels like adventure games I’ve played before. It’s art style can be described at nothing else but gorgeous. This game makes your 1080p 40 inch plus TV worth owning if only to play this game. I will be posting an interview about Journey, and other happenings from Robin Hunicke, the Executive Producer of Journey at thatgamecompany. It was a good talk with her, and she only furthered my belief that the people working at thatgamecompany are some of the most creative, ingenious people in the entire game industry.